KRASNAYA POLYANA, Russia — Bode Miller’s first thought in the start house Saturday was that he was going to take it easy on this, the final day of training before Sunday’s Olympic downhill. Then, being Bode, he thought, what the hell. He had an opportunity to express himself in the manner of a great artist at the top of his work. Which is what he is, as we should all recognize. BARCELONA -- The world after Michael Phelps gets underway here shortly in sun-splashed Spain, or at least that part that everyone outside serious swim geeks would be inclined to pay attention to, the 2013 swimming world championships, and from all over the globe they sought Friday both to downplay expectations while asserting that quite naturally the point in racing is to win. "It's kind of a down year but everyone is getting ready to race," American Matt Grevers, the London Games 100 meters backstroke gold medalist, said, summing it up perfectly in just one short sentence. It's the year after the Olympic year. Some people are in tip-top shape and others, well, maybe not so much. The thing about swimming is it has no pity. It reveals who has put in the work. That's what Phelps understood during and after the world championships in Shanghai in 2011, and -- candidly -- what these championships are likely to show, indeed what the build-up to this meet already has made plain. American Allison Schmitt, who won five medals last summer in London, including gold in the 200 freestyle, her signature event, didn't make the 2013 team. "She hasn't trained very much," her coach, Bob Bowman -- who is of course Phelps' longtime mentor as well and is the U.S. men's coach here -- told reporters at the time. He also tweeted a quote from the Chinese master Lao Tzu, "I have just three things to teach: simplicity, patience, compassion. These three are your greatest treasures." As these Barcelona championships unfold, with the U.S. team's 31 medals from London now just numbers in the history books, with Russian sprinter Vlad Morozov throwing down times like 47.62 in the 100 free just a couple weeks ago at the University Games -- simplicity, patience and compassion might be the watchwords for many. Then again, the U.S. might rise up as it usually does. The 2013 U.S. world team is made up of veterans such as Ryan Lochte, Nathan Adrian, Natalie Coughlin and Dana Vollmer, breakout stars such as Missy Franklin and Katie Ledecky and a whole bunch of newcomers -- eight national team rookies on the 51-person roster. Phelps -- he of the 22 Olympic medals, 18 gold -- is of course playing golf. He has said many times that he is doing so contentedly. That Phelps is not churning down Lane 4 in the final 50 meters does not mean, as France's Fred Bousquet rightly put it Friday, that there aren't any more stars in the worldwide swim constellation. Phelps always said his primary goal was to grow the sport and, as the London Games underscored, his brilliance has brought forth swimmers from all over the world -- South Africa's Chad le Clos, Lithuania's Ruta Meilutyte and others. "We should not be different now," Bousquet said. "Just chasing the dream like every other swimmer." Even so, the world championships in the year following an Olympics is always something of an odd affair. Everyone is acutely aware that the dream -- the real dream -- is three long years away. "We want to peak in 2016, not 2013," Michael Scott, the Australian team's director of high performance, said at that team's news conference following the Americans -- the Aussies trying to effect a wholesale change in what an independent review called a "toxic" team culture following just 10 medals won in London, only one gold. The new Aussie way, Scott said, is "by being professional in and out of the pool and doing that with team unity and enjoyment," the theory being medals will follow. Ryan Lochte, meanwhile, sounded a lot like Michael Phelps circa 2011 -- Lochte also emphasizing that his main goal was Rio in 2016, not Barcelona 2013. "I knew I had to get back in the water eventually," Lochte said, meaning that if he was going to swim here he had to resume training after his reality-TV show and other out-of-the-pool adventures. "Joan Rivers -- she's awesome. She's a character. Being on her show, it was a lot of fun. Before the show, they told me to wear a swimsuit and I was, like, all right. I put it on under my actual business suit. During the show, she told me to take it off and -- I did. I mean, what can I say? It was a lot of fun. "You never know what to expect with her. One time I was sitting on a chair talking to her, next thing I knew I was in a fountain still talking to her. It was a lot of fun." To be fair to Lochte, he didn't just volunteer this story. He was asked about hanging out with Joan Rivers. Then again, before this year, Lochte acknowledged, he had been a beast in training. This year, though, he said, "I took a long break. I don't know if it's going to help me," adding, "My body needed to re-charge. Now I am back in the water and I am excited to race." Phelps said almost the same thing at the world championships in Shanghai in 2011 before Lochte drilled him in the 200 individual medley, setting a world record, 1:54 flat, Phelps finishing 16-hundredths of a second back. That loss spurred Phelps to get back in the pool for hard training. In London, Phelps won the 200 IM, in 1:54.27; Lochte took silver, in 1:54.9. "I mean, Phelps -- there is no doubt about it, he is going to go down in history as the best swimmer ever," Lochte said. "I was just happy I was part of it. He is the hardest racer I ever had to go up against." Bowman, asked for probably the jillionth time whether Phelps is coming back, offered his practiced reply: "Well, my answer to that is always -- when I see it, I will believe it, and I have had no indication to this point … that's where I will leave that one." Which is where this meet gets going. 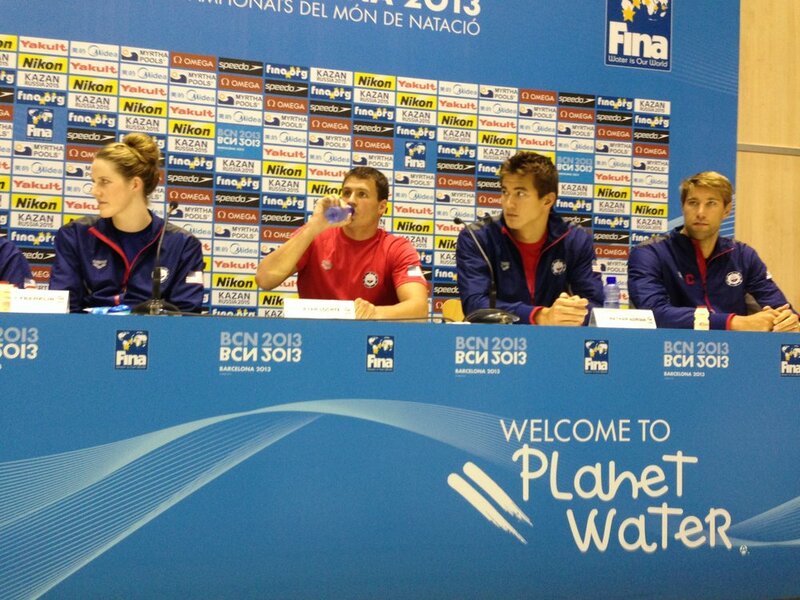 Racing starts Sunday, with the first big event the men's 4x100 freestyle relay. Michael Scott, the Aussie team leader, was asked the key to the relay. In the way that Grevers succinctly summed up the meet, so did Scott: "Swim fast." There is more of the infrastructure for the Games already built and ready to go in Madrid, 80 percent, than there is popular support, 70 percent, for the Games in Tokyo. If these IOC campaigns were only, solely about such so-called "technical" merit, Madrid would be your slam-dunk winner. As they know full well here, though, this being Madrid's third straight bid for the Games, there's way more to it. The sports venues, hotels, roads, all of that -- there has to be a story beyond bricks and mortar to win IOC votes. And that is the part of the game where an entirely different set of numbers comes into play. Here the challenge is the economic crisis that has beset Spain. The unemployment rate hovers at 26 percent. Fundamentally, Madrid's bid presents the IOC with a fascinating proposition: can a prudent, indeed fiscally responsible, bid that comes along at an important time in the Olympic movement's history make its case? "Madrid has already attempted to win the bid on two previous occasions and was not successful then," the prime minister, Mariano Rajoy, said Monday. "But now we are convinced it can -- so we are going to battle hard to win now." Madrid, Tokyo and Istanbul are the three candidates in this 2020 race. The IOC will pick the winner Sept. 7 at a vote in Buenos Aires. The evaluation commission visit to Tokyo ended March 7. Its tour of Istanbul begins March 24. As in the other two cities, its stop here will take up four days. Back once more to some numbers. Because, as the saying goes, numbers don't lie. Despite the recession, Spain's second in three years, public support for the Olympics has trended remarkably high. An IOC poll conducted last year in Madrid and the surrounding area showed 78 percent support for the Games. Talk to the locals, mayor Ana Botella said Sunday in welcoming reporters to town: "They are the best asset." Of 35 proposed venues here, 28 are already built. The budget to get the rest done: $1.9 billion. Botella, again, now at a Monday evening news conference: "The funding of the infrastructure is fully guaranteed." Spain's sports minister, Miguel Cardenal, sitting next to her: "OK, it's a large figure but in proportional terms it's almost insignificant, and the economic benefits that are referred to in the comprehensive forecasts are reasonable and encouraging, too." In Olympic terms, $1.9 billion for all-in infrastructure needs to be appropriately understood. For comparison: the cost to re-build the stadium alone in Tokyo is $1.9 billion. Their infrastructure estimate runs to about $4.9 billion -- the Japanese stressing they have the money sitting in the bank. Madrid's $1.9 billion, meanwhile, is one-tenth the size of Istanbul's $19.2 billion capital cost budget. Madrid's venues are indisputably world-class. On Monday afternoon, commission members kicked around soccer balls at the Santiago Bernabeu stadium, where Real Madrid plays. A novel turn to the 2020 bid would see the Las Ventas bullfighting ring, where the 2011 Davis Cup final was played, covered with a retractable roof, and turned into a 20,000-seat men's and women's basketball venue. The IOC likes to talk a good game about asking host cities and countries not to spend egregiously. But in recent years it has all the same opted for major construction projects. See Beijing 2008, London 2012, Sochi 2014 and Rio 2016. If you factor in the predilection to try new destinations, you would also include Pyeonchang 2018. All this will have some inevitably suggesting it's Istanbul's time. But there is only one hard and fast rule about trying to predict the IOC: it is entirely unpredictable. And perhaps there are broader currents at work that indicate the time has come for the IOC to finally and fully pay attention to the Pound Report, the 2003 study it adopted wholly, that says prudence and fiscal accountability are actually sensible notions. Rome, for instance, backed out of this very 2020 derby last year, saying it was too expensive. On March 3, voters in Switzerland turned down funding for a campaign for the 2022 Winter Games in St. Moritz and Davos; at issue was a study that said public money should cover $1.06 billion of the projected shortfall from staging the Games. Last Tuesday, in Vienna, voters said no to a referendum to the city's plans to bid for the 2028 Summer Games. Another fact: within the IOC there will remain some measure of implacable opposition to Madrid's plans, simply and bluntly because of the economic crisis. How, some members will rationalize, can you come here when the place seems to be under siege? There didn't seem to be any evidence Monday of a siege mentality in Retiro Park in central Madrid, where they would play beach volleyball in 2020. The sun was out. So were bunches of young families with their strollers. And skateboarders, too. 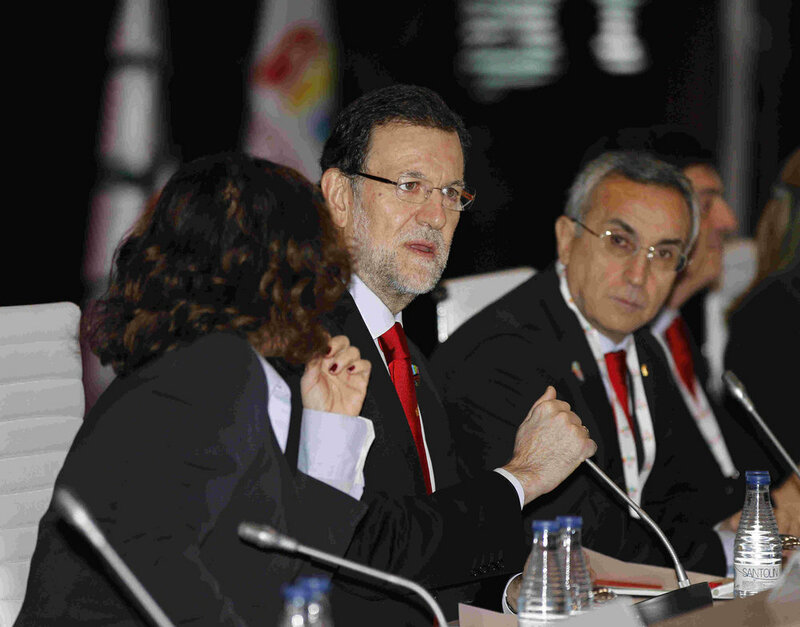 As Rajoy reminded the commission, 58 million tourists come to Spain annually. It's the world's third-leading tourist destination. Mikaela Shiffrin, who turned 18 this week, is going to be making the rounds this coming week in New York City. Tuesday night it's the David Letterman program. Wednesday morning it's the Today show. This is what happens when you have the sort of breakout season Shiffrin struck for herself on the alpine ski racing tour, the kind she cemented with a fantastic, come-from-behind victory Saturday to win the season-long slalom title at the World Cup finals in Lenzerheide, Switzerland. Shiffrin was not only down by 1.17 seconds after the first run, which is a huge margin, she was behind Tina Maze of Slovenia, who has had the best season of any skier -- male or female -- in ski racing history. Shiffrin then went out in her second run and simply scorched it in a 56.76-second run. No one was remotely close. Her winning time: 1:55.60. Bernadette Schild of Austria took second, her first-ever World Cup podium finish, in 1:55.8; Maze dropped to third, in 1:55.95. Her win came on the same day that Ted Ligety, also skiing in Lenzerheide, won his sixth giant slalom of the season. He and the legendary Ingemar Stenmark of Sweden are the only racers to have won six or more World Cup giant slalom races in a single season. Ligety locked down the season World Cup giant slalom title last weekend after winning in Kranjska Gora, Slovenia. Maze, meanwhile, started Saturday with a seven-point lead in the season slalom standings. With Saturday's 1-3 finish, Shiffrin ends the season with 688 slalom points, Maze 655. For the season, Maze has 2,314 points. And counting. There's a giant slalom scheduled for Sunday. This was Maze's 23rd top-three finish of the year. She said, in remarks published on the FIS website, "23 podiums in a season [is] of course positive. It has been an amazing season and it is not easy to keep up the pace that I had, standing on the podium week after week. "As far as the season goes, I am really proud but of course on days like today, especially right after the race the disappointment is high. The sadness will go away but it's normal to feel disappointed when you have an opportunity like the one I had today. You have to learn from your mistakes. Mikaela has been dominating slalom the whole season and I don't think I lost the globe here today but somewhere else." Shiffrin becomes the first U.S. slalom champ since Tamara McKinney in the 1984 season. Shiffirin is the first non-European to win four World Cup slalom races in a season. She also stands as the third non-European to win the slalom title. The others: McKinney, and Betsy Clifford in the 1971 season. For emphasis, once more -- Mikaela Shiffrin is only 18. After the race, she made three comments that speak to what a special talent she is. "After the first run, I went directly to our athlete tent and just tried to sit quietly and figure out what I needed to do to make it better. That's something that I've always done, is just analyze what I could do better and make it better. It's hard to do that between runs in a race But my mom helped. My coaches helped. My dad helped. Everybody. "They all said the same thing: 'You have to let it go. You can not hold back. There is nothing to lose.' So I tried to do that." The second shows off what a class act she is. "I think half of this globe belongs to someone else. I want to thank Tina Maze. She has really helped inspire me. It felt good that second run but I was freaking out. "She's my greatest idol this season and I respect her so much. Some part of me wanted her to win just to prove once again that she's the greatest skier in the world this season. But I wanted to win because it was my goal and I don't want to give up my goal. It happened that I won today and I'm really grateful for that." The third is maybe the best. Mikaela Shiffrin, again, is just 18. The Sochi Olympics are coming straight up. Wait until she shows up on Letterman and the Today show and they see what she is about. Because she is -- genuine. "Yeah, Letterman! I'm so excited about that. It's going to be really cool. Hopefully I don't trip when I'm gong on stage. If you knew me for longer than a day you would know that I spill things and I break things and I trip a lot. You would not think I'd be good at slalom. So we'll see how that goes." Twelve years ago, in Soldier Hollow, Utah, Kikkan Randall made her first World Cup cross-country skiing start. She finished 24th and, at the time, as she recalled Saturday, "That was so exciting." Times certainly have changed. On Saturday, after qualifying 11th and powering through the heats, Randall skied past world champion Marit Bjoergen by a boot length to win a freestyle sprint in Lahti, Finland. "My skis were awesome today and it's really cool to see what a well-oiled machine we have become," Randall said afterward, underscoring the emphatic reality: in the sprints, the U.S. cross-country program has emerged as a genuine threat to win. The victory Saturday clinched Randall's second straight World Cup sprint championship. Barring injury, Randall will start next season as one of the favorites for an Olympic medal next February in Sochi. A few weeks ago, Randall and Jessie Diggins won the team sprint title at the world championships. An American has not won an Olympic medal in cross-country skiing since Bill Koch in 1976. No American woman has ever won an Olympic medal in the sport. The race Saturday marked Randall's 100th career World cup start. As she said, she was "really hoping to make it a special one." It turned out to be her 11th career World Cup or World Cup Stage victory. For the season: her sixth World Cup or World Cup Stage win. The win gives Randall 488 World Cup sprint points; Justyna Kowalcyzk of Poland has 280. That's a 208-point lead; there are two sprint races remaining, meaning the most anyone could make up is 150 points. On the men's tour, Sweden's Emil Joensson wrapped up the men's sprint title by defeating Ola Vigen Hattestad of Norway; Joensson now has 466 points. Andy Newell of the United States is second, with 236. Bjoergen was the only woman Randall had yet to face in a skate sprint all year; the Norwegian skier, long viewed by many as the best in the world, had missed every skate sprint before Lahti because of heart trouble in December. The race Saturday -- on a short, twisty course -- came down to a photo finish. Bjoergen didn't quite have the lunge, Randall did, Randall winning by seven-hundredths of a second. After the finish, the two racers shared a hug. Bjoergen understandably said later, "I have not raced that much so I feel like the World Cup season has just started for me." As Randall told the website fasterskier.com, "We're good friends and we got to laugh about it. I asked her what World Cup start this was for her. I said, 'You're probably over 200 by now.' And she said, 'Yeah, probably.' "
Randall also said, thinking back to her first start 12 years ago: " … It's pretty funny that, 100 starts later, we're in the hunt for the win every time in the skate sprint now. I got to go up against one of the world's greatest athletes today and it was definitely close there at the end. "She was coming on strong but it's just nice to know that … it's taken me a lot of races and a lot of time to get to this point but if you put in the work and stay dedicated then you can be the best in the world.